If you are lucky like us and have plenty of state-of-the-art metrology equipment, you may use a laser interferometer. The latter is highly accurate (measurement uncertainty of 0.001 mm), but is expensive (about US$50,000), difficult to set up and measures only one coordinate at a time. You can also use a CMM, but that’s obviously not practical. You can use various types of 3D measurement equipment, but I am pretty certain that industrial robot manufacturers use laser trackers since they already use these for calibrating some of their robots. The problem with laser trackers (other than their prohibitive cost) is that they are not sufficiently accurate to measure position variations of the order of 0.010 mm. So should we believe the repeatability data supplied by industrial robot manufacturers? One of the basic methods presented in ISO/TR 13309:1995 relies on the use of three orthogonally arranged position sensors. I recently bought one such fine device: the Trinity probe from IBS Precision Engineering. The latter is wireless, light and compact, and not that expensive (about US$15,000). Its measurement uncertainty is about 0.001 mm, and its measurement range is 3.5 mm. Unfortunately, it uses eddy-current sensors that call for special datum spheres, which cost more than US$500 each and are mounted on slim stems that are very easy to break. I therefore adopted the idea of Prof. Jean-François Brethé from Université du Havre (France), who used three orthogonally placed digital indicators. However, I didn’t like the fact that his indicators are all cabled and opted for a more compact, wireless solution. Our 3D probe consists of three ID–C112X (543-390B) digital indicators, three wireless transmitters U–WAVE–T and one U–WAVE–R receptor, three U–WAVE cables, and the U–WAVEPAK software, all from Mitutoyo. It also consists of three 0.5″ magnetic nests from HUBBS, three V–blocks and a hollow 0.5″ precision sphere from Bal-tec, and two custom precision machined supports from aluminium. The cost of the complete device, including machining, is less than US$6,000. 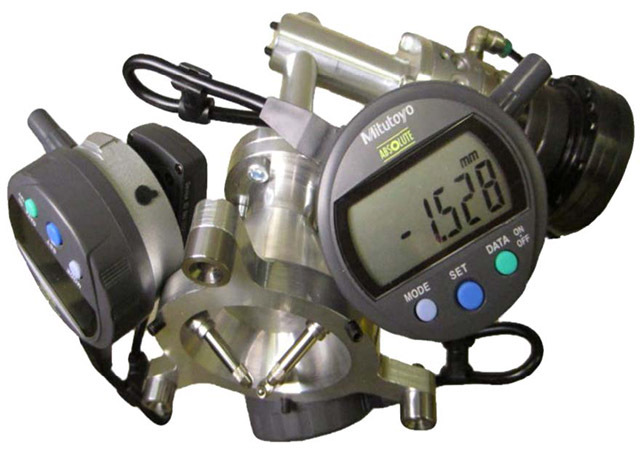 The device, including an adaptor and a QC–5 tool changer weighs only 1.2 kg. A very important—and novel—component of our 3D probe is its calibration plate. The latter is essentially a kinematic platform using the principle of three spheres on three V-grooves. It allows us to position over and over again a 0.5″ precision sphere in exactly the same place with respect to the 3D probe and set the zero for all three indicators. We tested our 3D probe on a FANUC LR Mate 200iC industrial robot (lent to us by GE Aviation) and on an ABB IRB 120 robot. For our test, we use a custom-made pivoting base with three 0.5″ datum spheres, each pair separated about 300 mm apart. Using very simple Matlab code, we are able to retrieve the position data from each digital indicator and then send it to the robot controller via Ethernet. The controller of each robot then runs a program that performs the testing automatically. This testing procedure is as follows. For a given end-effector orientation, the robot automatically aligns the 3D probe to each of the three datum spheres through several readjustments until each indicator is at zero (±0.002 mm). Then we record the end-effector’s position (actually the robot’s configuration) and send the robot 30 times to each datum sphere, first in a clockwise order and then in counter clockwise order. We tested the same set of five different end-effector’s orientations on each robot. Although our procedure did not follow the ISO 9283:1998 norm (the test positions need to be at the corners of a large cube), our results suggest that both robot manufacturers specify correct data. In the case of the LR Mate 200iC, the mean position repeatability that we measured was exactly as specified: 0.020 mm. In the case of the IRB 120, the mean position repeatability was 0.013 mm (whereas ABB specifies 0.010 mm). Note, however, that these are average values. In the LR Mate, for some end-effector orientations, we observed repeatability values of as much as 0.040 mm. In the IRB 120, the worse position repeatability was 0.018 mm. We believe that our device provides the most affordable and practical method for measuring the position repeatability of industrial robots. If you are interested in it, we would be glad to share our experience with you.